the PATTERN from the IPO was crushed…. recent 3 month candles are HUGE! the patterns shown are BEARISH. 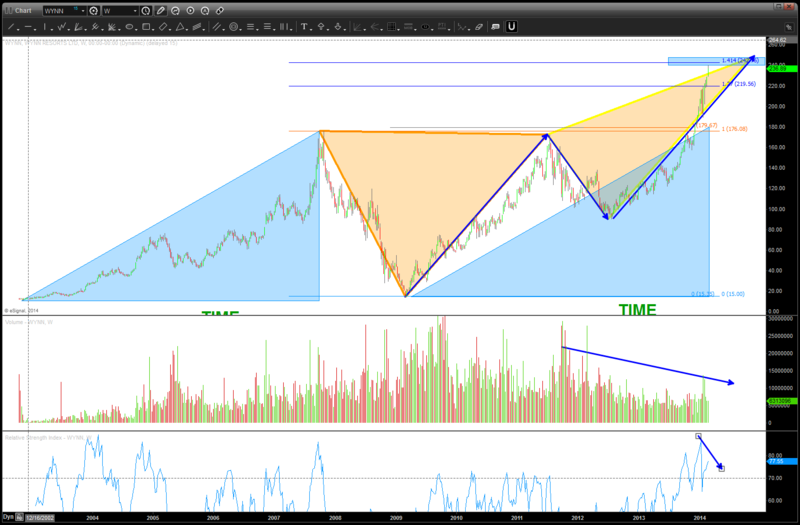 FOR MY FELLOW CHART PEOPLE: the PATTERN in price was defeated, however, the PATTERN in time is MARCH. We’ll know…soon what will happen. THESIS: IF WYNN keeps going HIGHER so will the stock market (bullish) HOWEVER, if people are BUYING a company that makes its living on speculation, tourism and “it didn’t happen here” Vegas — then isn’t it a contrarian indicator that this ENTIRE rally since 2009 is a house of cards? We will find out — soon. 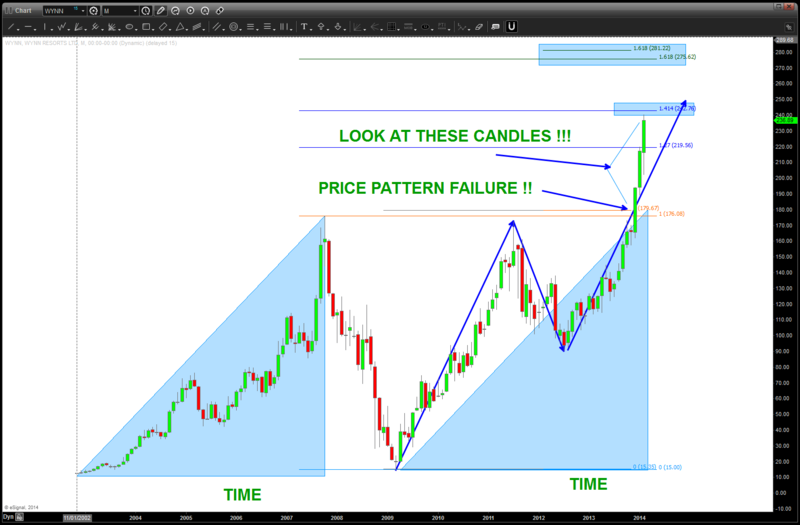 WYNN “slaughtered” the PATTERN at/around 180 w/ a vengeance …. KABOOM! Full disclosure — I have stayed at the WYNN and, well, it’s amazing … if you get the chance, spend the extra bucks and do it. Well done, amazing service, first class! So, here’s the rub. WYNN, no matter how much net worth you have, is a choice and the last 3 months candles are the STRONGEST in the history of this stock. So, again, what am I missing? Sure doesn’t feel like the roaring 20’s right now or even the euphoria rolling into 2000. Folks, this defies convention … when this puppy is hit by Sir Issac Newton, watch out below ….